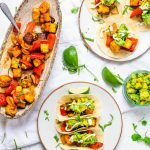 Vegetarian Chilli for Kids by Amy at Healthy Little Foodies (Pictured, left)| This is baby friendly if you use sodium free stock or sub with water | A great way to get some veggies and bean gobbled up! Amy notes that the vegetables kind of melt into the delicious tasty sauce, so if your tot has some issue with textures and whole veggies, but loves flavorful tomato sauces, you’re onto a winner. 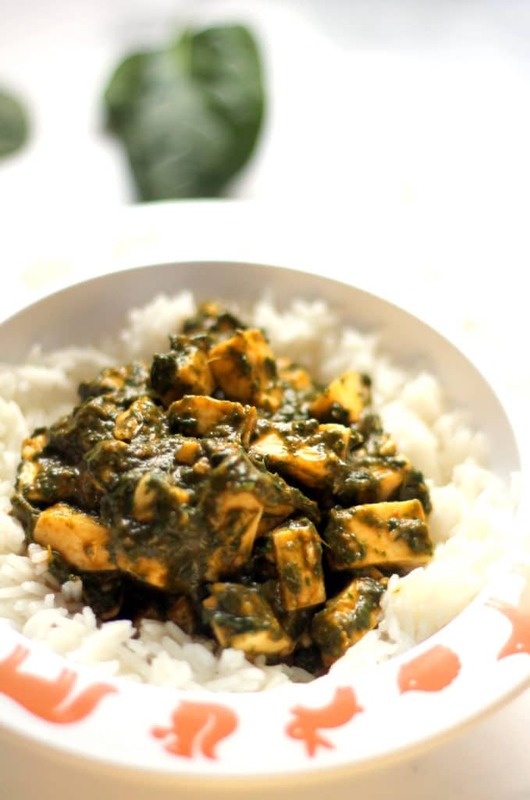 Palak Paneer Curry for Babies (Pictured, right) | I never expected my tot to like this, but oh boy was I in for a shock. It can get her gobbling a bowl of pureed spinach with great enthusiasm, so I consider it a miracle recipe. 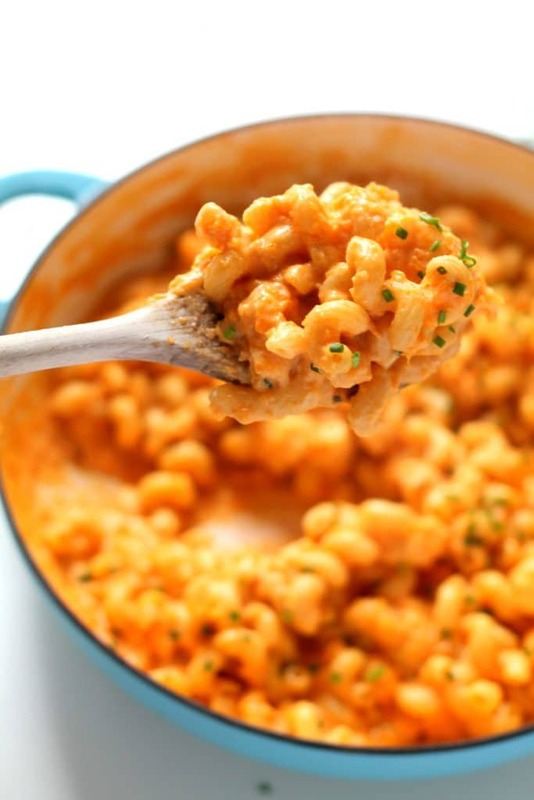 Roasted Butternut & Goat Cheese Mac & Cheese | Pictured, left |A little smoked paprika elevates this mac and cheese’s flavor credentials, and plays beautifully with roasted butternut squash, an ingredient they’ve probably learned to love from their puree days. 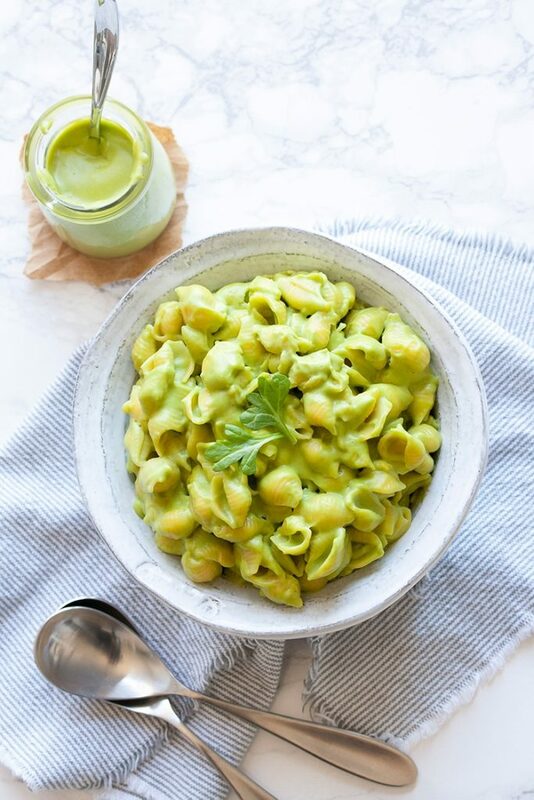 Vegan Green Mac and Cheese from Veggies Don’t Bite | Pictured, right | Make suitable for under 1’s by eliminating the salt | Because vegan and dairy free babies need a great mac and cheese recipe too, and this one is twisted up with lots of stealth veggies and miso for flavor. 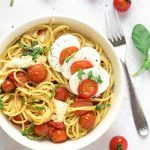 Hummus Pasta from Oh She Glows | For under 1’s it’s ideal to use use homemade hummus without salt to reduce sodium intake | If there’s one thing you can count on a vegan mama to do, it’s bringing the hummus! In this recipe, hummus is mixed in with tomato sauce to create a dish full of protein and healthy fats, with awesome flavor and a creamy texture. 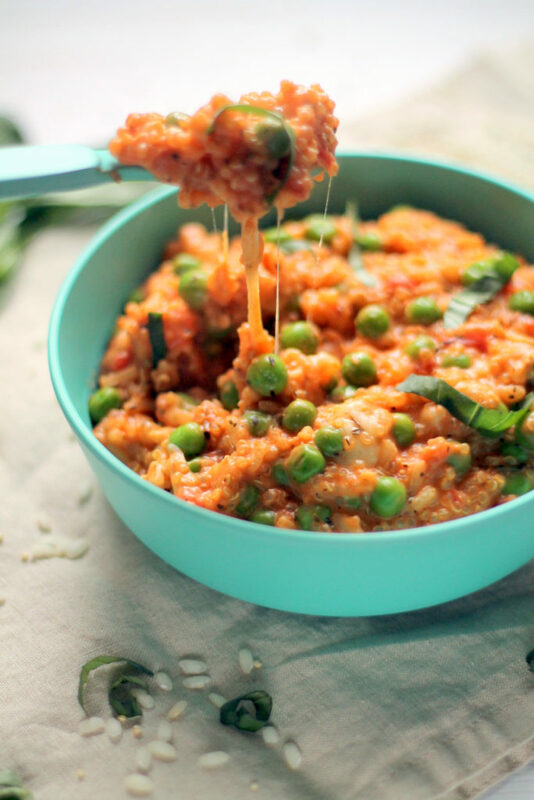 Tomato & Mozzarella Quinoa Risotto | Pictured | Full of herbs, fun stretchy mozzarella and sweet mascarpone, this risotto is a delicious dinner for babies with a developing love of Italian flavors, and is a great way to get some superfood quinoa in their tummy. 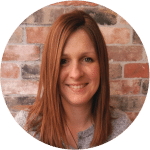 Baby and Toddler Soup Recipes by Kelly at The Pretty Bee | If your sophisticated tot wants to sip a warming soup on a winter’s eve, these recipes are a great start. Crackers or bread sticks are the perfect accompaniment for tots who like to to dip! Kale, Spinach & Apple Quesadilla from Michelle at Baby Foode | Once your older baby is competently feeding themselves, little quesadillas can be an easy, healthy meal. 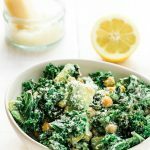 Michelle’s recipe uses pureed spinach and kale for the most baby friendly texture, with some soft beans and cheese too. Serve this in tiny bite size pieces, or large strips, depending on your tot’s preferences. Falafel Sliders by Mandy at Sneaky Veg | Healthy, flavor packed falafel – an ideal dinner to get your tots exploring Middle Eastern tastes. Mandy’s version is perfectly kid sized, and leaving out the salt makes them perfect for under 1’s. Foodie parents are happy for their tots to indulge in a little sweet treat from time to time – with the knowledge that there are plenty of natural, wholesome ways to make treats! 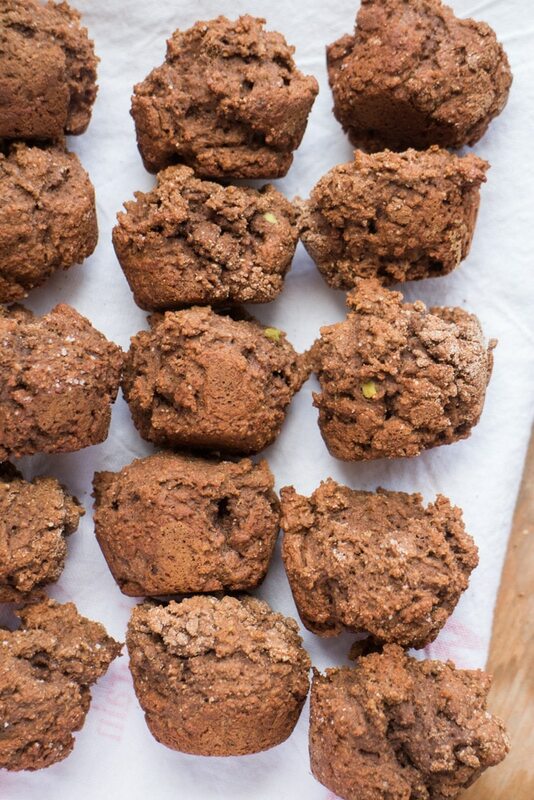 Chocolate Avocado Baby Muffins by Pamela at Brooklyn Farm Girl | Pictured | Using superfood avocado as a baking ingredient is pure genius, and makes for a great healthy dessert full of good fats – something Pamela likes to share with her tot after each meal. Banana Yogurt from Healthy Little Foodies Fruity yogurt is a godsend to parents, often one of the most easily accepted foods! Amy points out that many of the store bought yogurts have added sugar and it’s actually very easy to make your own with brown bananas. She suggests adding cinnamon or cardamom for a little extra twist, something none of the store bought brands do, which I can definitely get on board with! Baby Chia Pudding by Sarah at Fried Dandelions | Coconut milk, cinnamon and vanilla flavor this luxurious chia pudding for babies. Not only are chia seeds a healthy superfood, they have a fun texture for tots who are moving on up from purees. 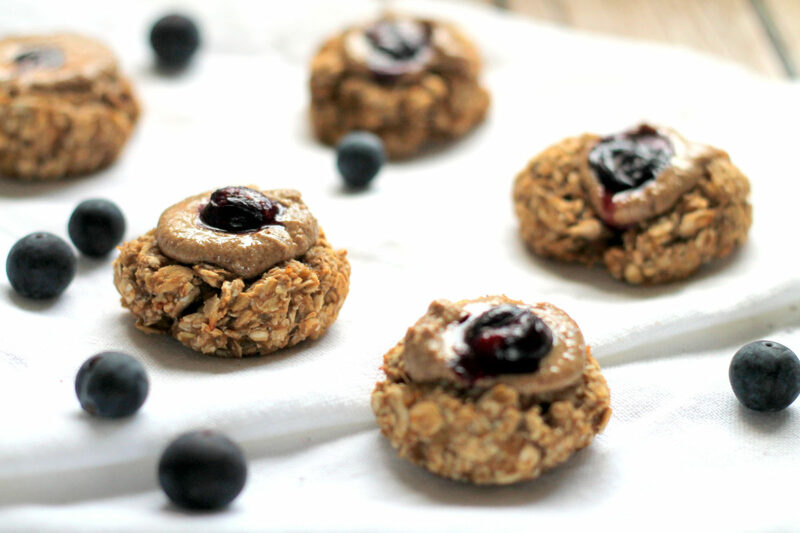 Banana Peanut Butter Breakfast Thumbprint Cookies | Pictured | Oats, banana, cinnamon, vanilla, peanut butter and blueberries are all you need to put together this cute healthy cookie for your tot to enjoy. Thanks to the banana, vanilla and cinnamon, this is beautifully sweet with zero need for sugar.. And it doubles up as an energy booster for mama! 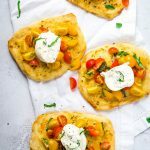 Are you a foodie parent with some great recipes up your sleeve? Tell us all about them in the comments! 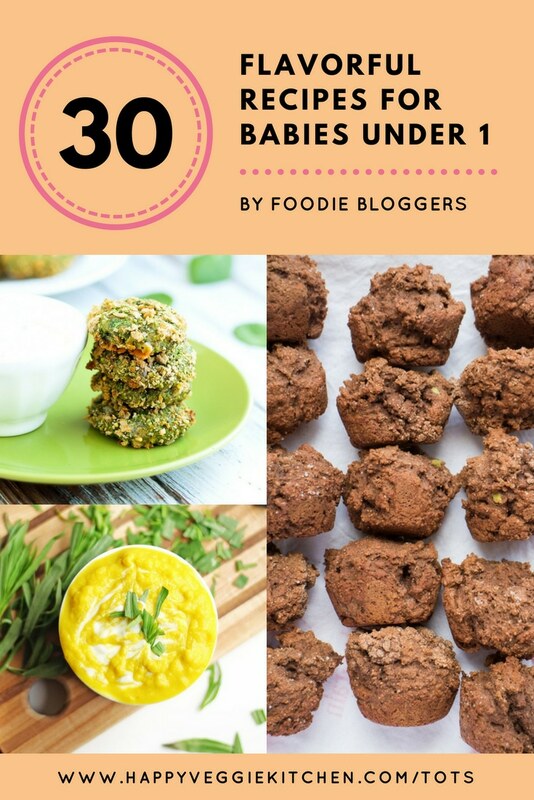 If love homemade baby food recipes, subscribe to our newsletter and follow our Happy Veggie Tots Facebook page to keep updated!